・A field of Spirited Away!? ・Actual movie of 100-million-yen toilet!! Have you heard about a toilet which worth 100 million yen? Probably most of you are doubting such thing really exists in this world. Today I would like to introduce this gorgeous toilet to you by showing some movies. Hope you enjoy till the very end! Gajoen is a complex facilities located in Meguro, Tokyo with wedding chapel, hotel and restaurant combined. It was built by a Japanese chef in 1931. In the past, Gajoen attained great popularity among both people of a warrior family and common people because of its gorgeous interior decoration and unusual menu. It was even called “Dragon Palace of Showa” where people can fully enjoy the Japanese culture of the good old days which can seldom be seen in the modern period. Original stage of Spirited Away!? There is a saying that here, Meguro Gajoen is the stage of the Great Bath House of “Spirited Away”, an animation film of Studio Ghibli. For those who are interested in the films of Studio Ghibli, this is a place you should definitely visit not only for the 100-million-yen toilet. Let’s see the movie of 100-million-yen toilet!! Now it’s time to see the actual movie of this 100-million-yen toilet! Probably, you are not likely to find such a gorgeous toilet anywhere else in this world. How was the movie? There is a bridge and huge stone in the toilet right? You can see how delicate the work of decoration is from the fact that they even painted Japanese-style pictures on the ceilings. As you can see, the door is carefully decorated with fine patterns and even the knobs are all painted gold, which makes people feel hesitant to hold them. Entering the single toilet room, the space is big enough for you to relax so that you may want to stay there for about 1 hour after reliving yourself. If you look up, you may see the picture of young woman on the ceiling staring at you, which is quite embarrassing. Did you see the video to the last? If so, you would see the elevator being equipped right beside the toilet. 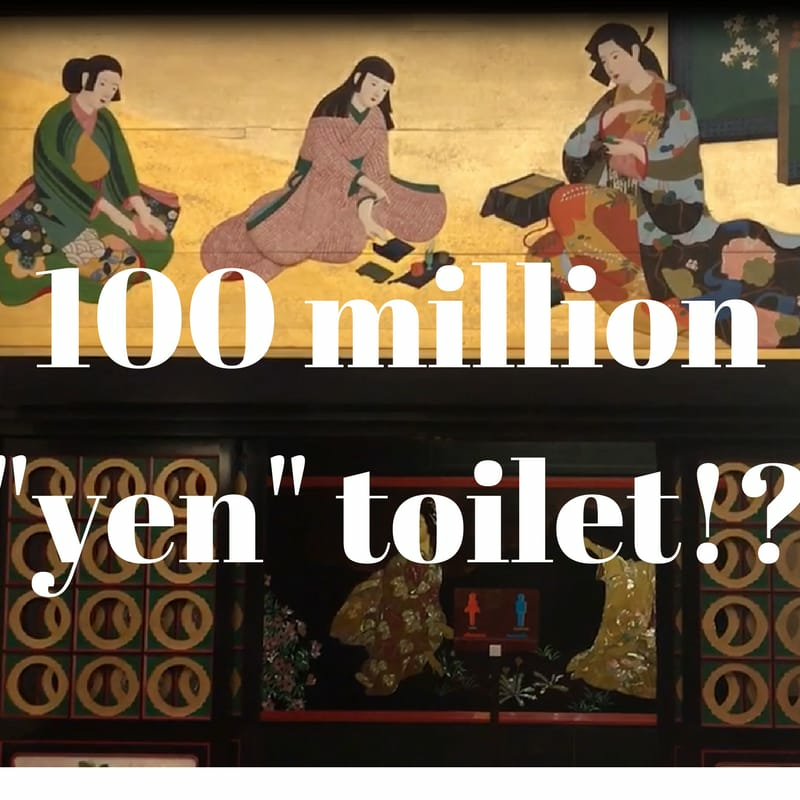 Though it has not been officially proved that this also costs 100 million yen to make, it was also very finely decorated, which is worth visiting together with the toilet. How was it? Famous spots such as skytree and Kinkakuji-temple are surely great choice for your trip to Japan, but visiting this 100-million-yen toilet will also be fun!